As with our other reports, right click on the Reports branch in Solution Explorer, pick Add New Report, and (if you haven’t already disabled it) click next to move past the welcome screen. Step 2. Set the data source. Pick the Contoso shared data source, or setup a new source to Contoso, and click Next. Step 3. Setup the query. Step 4. Set the format. For the report type we’ll use the simple Tabular format, so just click Next. Step 5. Determine field placement in the report. To keep this simple we’ll not use any groups on this report, so just put all report fields into the Details section. You can do it in one easy step by clicking on the top most item (FiscalYear), holding down the shift key, and clicking the bottom item (TotalAmount). This will select all of the fields, just click the Details button to move them. Then click Next. Once again we’ll go with Corporate for the style and click Next. Step 7. Name the report. Finally we’ll give the report a name of “Regional Sales by Subcategory” and click Finish. Step 9. Apply sorting to the column headers. Here’s where the magic happens. 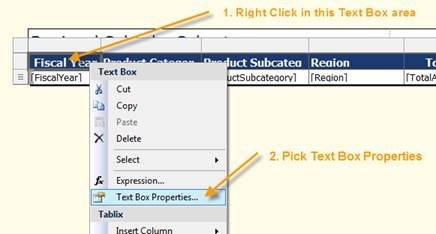 Right click on the first column of the report header, which should be Fiscal Year, and pick Text Box Properties. In the Text Box Properties dialog, first navigate to the Interactive Sorting area. Next, check on “Enable interactive sorting on this text box”. Under “Choose what to sort” we’ll take the default of details. If we wanted to sort our groups, we could have picked the Groups option then picked the name of a group. Repeat this step for the other columns, selecting the data associated with that column in the “Sort by” area. You should now be able to switch to the Preview tab. At the top right of each column you will now see a set of tiny up/down arrows, which when clicked will cause the report to sort by that column. woot woot … thanks for this. Beautifully explained! However, I have a “but”. I want to sort a couple of fields by date, and this is doing interactive sorting on a text box. So 01/05 comes before 03/04. Is there a way of telling it to sort dates into order? Thanks, but how to do this with option Visibility to hide?